Pick up is available at our Farm Store during open hours. Or By appointment, send a message to set up an alternative time. If you cannot make your original pick up time please contact Clark's Farm. If you miss your selected pick up please contact Clark's Farm to make other arrangements. Items will only be held for one week after the original pick up time. Payment may be made at Clark's Farm. Clark's Farm is a small seventh generation family farm in the heart of Howard County. We raise our vegetables and animals in a sustainable manner that benefits the animals, the consumer, and the land. We are very proud of our 100% grassfed beef. Letting our cows graze throughout their lives gives them the diet that is best suited to them. Our sustainable farming practices help us protect our streams, rivers, and the Chesapeake Bay while creating a better flavor in our meat. We work with the Maryland Grazers Network in an ongoing effort to improve our pastures, our soils and the health and well-being of our cattle. Check out our website for more information about our farm! Our pigs are raised in pastured and wooded areas on our farm throughout their lives. They are allowed to run, play, root, and express their "pigginess" all day long! 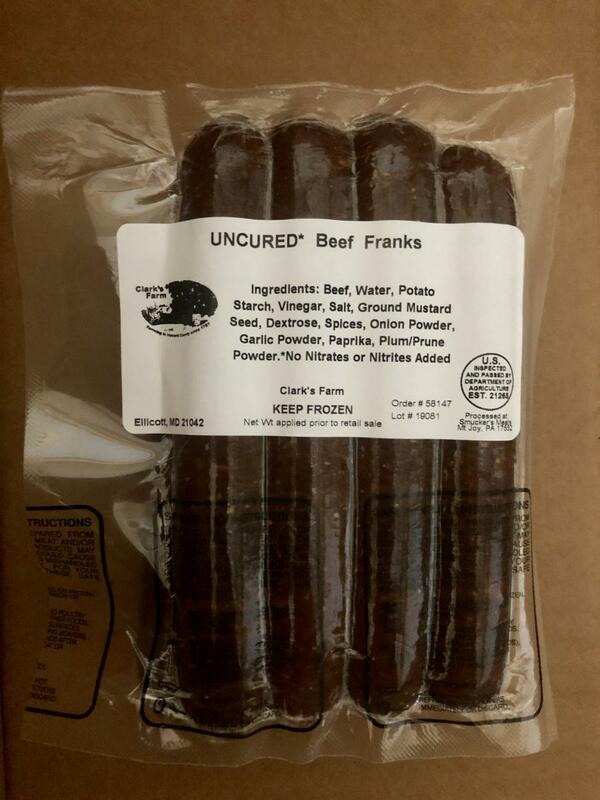 In addition to what they forage they are given extra vegetables from our farm garden and a special blend of non-GMO grains (non-genetically modified organism). We also raise only non-GMO varieties of vegetables in our garden.